CS-Cart “Product packages” modification allows the administrator to create a bundle of different products that will be sold as a separate product. to group the products that compliment each other. Ability to create a new product as a product package and add products to this package. A product package has all features of a standard product – name, description, options, meta data, seo url, etc. except price and in stock info. Package price and In stock depend on the price and stock of the products included in a package. Total package price is calculated automatically depending on the prices of products included in a package. Also, it is possible to set discounts on products included in a package and the final package price will be calculated automatically based on set discounts. Ability for the administrator to enter the quantity of products included in a package. In the storefront on the package details page customers can buy the whole package only, they can't exclude products from the package. 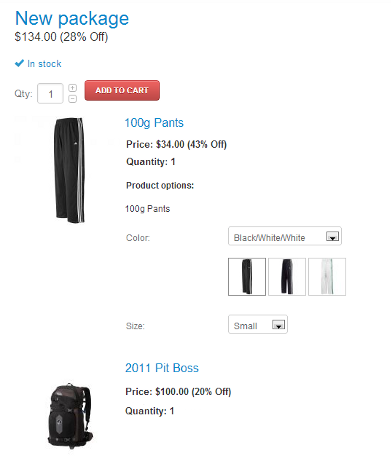 In the storefront on the package details page customers see what products are included in a package. By clicking on the product title, a customer can go to a product details page of every product included in a package and buy this product separately. If a product included in a package has options, customer can choose a necessary option. If a product included in a package gets Out-of-stock, the whole package gets automatically Out-of-stock. 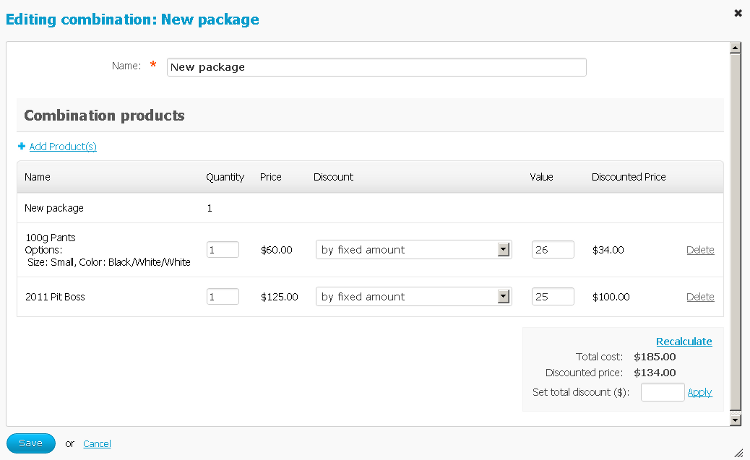 The package name and the products included in a package are displayed on the Cart contents page, in the invoice, on the order details page. Customers can delete the whole package from the cart. But products included in a package can't be deleted from the cart separately. The Product packages mod is not compatible with a standard Buy Together add-on. So, it is impossible to use both add-ons simultaneously. The Product packages mod is not compatible with Twigmo. In Multi-Vendor edition only the products of one vendor can be added to a package. Now we are ready to implement this modification for $400 on CS-Cart 3.0.x. This modification for CS-Cart 4.0.x. will cost $600.